Charlie McCreevy is an honest man. "I've never been ashamed to stand up for the way we do our business here. We do it by referendum. That's democracy." “We might not like the result on occasion . . . but that’s democracy and we should not be ashamed of it." We can't quite decide what's more astonishing about all this. The fact that Ireland's own EU Commissioner has clearly not read nor tried to understand the Treaty, or the fact that he is willing to admit it in public. Or maybe it's the fact that that people in their millions are not yet jumping up and down about this seriously ridiculous situation. Bruce Arnold, at least, made an almighty case against the stitch-up in Saturday's Irish Independent, writing under the headline "Government has abandoned democracy to get a 'yes' vote". "The duty of those two opposition parties, with the others, is not to side with the Government -- certainly if its objectives are spurious -- but to hold it to account. Their job is to ensure that we put before the people a fair, objective choice." "There is growing government determination to run the referendum campaign with huge, illegal support from the EU, preventing people from knowing what is in the treaty and what it means. This is what the debate is about." "The EU meeting they attended was designed to involve Europe in an entirely domestic Irish issue: that of Ireland deciding on its future in Europe. The EU should not be so involved; it is not its decision, it is ours. Yet Europe, at the top of its totalitarian structure, is up to its neck in such involvement, already committing huge sums of money to pervert democracy in the one country among 27 that can hold back this surge, this tidal wave of pernicious autocracy." "We have to decide, for ourselves and for other benighted member states who have been denied any process of deciding these questions democratically, whether we want to create a super-power and ever afterwards to be subservient to it." "The clarifications [protocols] in this case are less an explanation of what is in the treaty, than an affirmation of what is not. More nuanced it may be, but the question remains the same -- as does the treaty." Following calls from several corners in Germany for more referendums on EU issues, and with the German Constitutional Court due to rule on the compatability of the Lisbon Treaty with the German Constitution next week, Open Europe today publishes a new poll of German voters, which shows that 77% of them want a referendum on the Lisbon Treaty. See here to read the press release, which also has some background details. Interesting to note that EU Commissioner Charlie McCreevy has weighed into the Irish debate again today and remarked that voters in most other EU countries would also have voted no to the Treaty, if only they had been given a say. He added that many EU leaders were glad they had no legal obligation to hold referendums on the Treaty in their own countries. Too right. Back in 2007 Open Europe conducted the first ever independent poll of all 27 EU countries, and found that an average of 75% of all Europeans want a referendum on any new Treaty which transfers power to the EU (ie Lisbon) - and a clear majority in every single country. There was also no clear majority in favour of such a treaty - respondents were equally split with 41% saying they would vote in favour of a treaty that transferred more powers to the EU level, and 41% saying they would vote against. This is not the first time Charlie McCreevy has scored an own goal for the EU cause, having admitted during the first referendum campaign in Ireland that he hadn't actually read the text (just like the Prime Minister, Brian Cowen). It won't be long before old Charlie is told to get back in his box, before he does too much damage with his honesty. This editorial in the Wall Street Journal today is so spot on we are copying and pasting the whole thing here. It takes up some of the same arguments made in Open Europe's recent briefing on the outcome of the latest EU stitch up summit. This week the IHT reported that the EU had recruited French architect Christian de Portzamparc "to devise a comprehensive, 15-year plan" for Brussels "that would not only create new office space but also provide an architectural framework symbolizing the European Union." "I thought of a big and beautiful idea, that took this historic axis, linking the old and the new. It would be a city of Europe, with lots of periods present. It's a formidable opportunity... I told them it should be like a downtown American city, with three skyscrapers, yes, but with open islands, keeping historic buildings, with pocket parks." The idea to transform Brussels into the "city of Europe" has been around for a while - but not yet picked up anywhere in the British press. The Commission calls it “Operation Face-lift”. And the Commissioner in charge says the idea of the project is “to create an urban design with a strong symbolic identity”. They want to more than double the office area occupied by the Commission in Brussels, from 170,000 square metres to 400,000. According to German magazine Spiegel that's 10,000 extra offices for the swelling tribe of bureaucrats, as well as 40,000 square meters of commercial space and 110,000 square meters of apartments. "The idea is that EU administrators can stay in their idyll even after the workday ends. They can shop, go for a beer and even go home to bed all within the European Quarter." “All of this construction will cost hundreds of millions of euros, possibly even billions. There are no exact numbers for the project at this early planning stage, not even estimates. The necessary funds will be added into the budget later, little by little and in manageable amounts. By then, presumably, today's building dreams will long since be yesterday's decisions and by their own intrinsic momentum they will prevail against any critics and skeptics. So far, at any rate, only a few Members of the European Parliament have even raised an objection to the delusions of grandeur in Brussels. We called the relevant Commission department and an official said it is too early to give any estimation of costs, as no concrete proposals for building have been issued. He also said the winner of the competition has teamed up with several other architects to draft a proposal, but they are not receiving any funding by the European Commission. However it’s pretty clear the cost of the building will come out of the EU budget. from 2011: construction of new buildings. The Commission currently already occupies 61 buildings in Brussels, and a press release from the Commission in March tells us that it spent €206.9 million in buildings in Brussels alone in 2008 – including EUR 77.4 million in rent and EUR 129.5 million in expenditure on property purchases. According to the BBC, the last renovation of the Commission (the 15-year resurrection of the asbestos-ridden Berlaymont) cost a billion euros. EUobserver wrote about this in January, and noted that a German MEP had criticised the Commission for secrecy in the decision-making process. She also claimed that one of the Commissioner’s special advisors, Richard Boomer, is a Belgian real estate developer whose partner was one of the authors of the proposal for this project. Oh dear - the new 'Generation Yes' campaign in Ireland has fallen at its first hurdle. "The Irish people deserve an honest debate on this Treaty, we promise that our campaign will base all our arguments on the facts, and will reference all our statements. We don’t believe in attacking people personally, but we have zero tolerance for anyone who lies to the Irish people in this campaign. When people make false statements, we will respond immediately with the truth." "Are there any changes since last time we voted?" "Yes there will be changes to the Treaty, which means there is a new deal on offer." Uh-uh. An enormous, devastating, and unforgivable porky! “The Protocol will clarify but not change either the content or the application of the Treaty of Lisbon." “the text of the guarantees explicitly states that the Lisbon Treaty is not changed thereby”. "The summit conclusions set out the fact that the protocol does not change the relationship between the European Union and the member states, and that the protocol clarifies but does not change the content and application of the Treaty... The Treaty assurances have made explicit what was implicit in the Treaty already." “Nothing in the declarations materially affects the treaty text. If there was a material difference, then the Treaty would have to be re-ratified in all the other member states”. "From the French point of view, there are no difficulties with these guarantees since they only repeat and clarify the content of the treaties, without adding anything nor taking anything away... This does not pose problems for us because this protocol says nothing more, nothing less than what is in the Treaty." 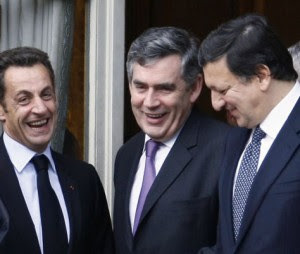 "The guarantees do not change the Lisbon treaty itself in any respect. They have the character of explanatory assurances. In other words, the Irish guarantees only confirm and explain what is already in the text of the Lisbon treaty." Oh dear oh dear oh dear. 'Fight the Lies' eh. Wonder what else they have got wrong - after all, this is pretty much the central, most important point of the whole argument. Because the Irish government explicitely promised not to make people vote on exactly the same text - recognising that this would be a ridiculous and wholly unacceptable thing to do after they had already rejected it. Promotion for trying to kill the opt-out? PA reports that Labour MEP for the North East of England Stephen Hughes has been made Vice-President of the Party of European Socialists the Progressive Alliance of Socialists and Democrats. "I think another useful study might be to look at the correlation between very long working time in Britain and teenage pregnancy, social dysfunction; a whole range of social indices that might well suffer as a consequence of the long working hours in Britain." Could this be his promotion for trying to kill the opt-out? According to PA, Gordon Brown today confirmed in Parliament that the 'guarantees' given to Ireland would "clarify but not change" the Lisbon Treaty. David Cameron pointed out that the claim that the guarantees made no change to the Treaty would be received with "great interest" by the Irish people. "Why are Irish voters being forced to give their views twice when the British people haven't been asked for their views once? Will you explain why the protocols won't be debated or put into place until the next countries join the EU. Isn't it the case the Government wants to delay this until after the next election. They don't want the embarrassment of having to vote yet again in the Commons to deny people the referendum they originally promised." "Cowen says he has now read the full text of Treaty"
So the guy who has been frightening the whole of Ireland about the 'disasters' of rejecting Lisbon didn't actually know what was in it? The guy who insitsts those calling for a 'no' vote don't know what they're talking about, hadn't actually read the thing himself? Absolutely unbelievable. And we thought Caroline Flint was bad. Why on earth should anyone trust this man to know what's best - he clearly didn't the last time around. The conclusions of the EU summit have finally arrived. Despite a whole year of promising to respect the Irish no vote, EU leaders have decided not to change a single word of the Lisbon Treaty to reflect Irish concerns, and instead will hand it back to them to vote on exactly as it was before. There won't even be the shifting of paragraphs around that we saw after the French and the Dutch voted no to the original EU Constitution. That would have caused too many headaches for other EU leaders - any changes at all to the text mean that the whole thing has to be ratified again. The Council decided on a list of declarations, but because these have absoultely no force in EU law, they will need to be ratified by all member states at a future date - and EU leaders have decided that should be done alongside ratification of the Croatian Accession Treaty - whenever that comes along. A huge question mark therefore hangs over whether or not the declarations will ever actually become legally-binding (any member state could in future decide not to bother ratifying, or a Parliament might reject the Treaty), but as the conclusions themselves acknowledge, even if they do enter EU law, they do absolutely nothing to change the text of the Lisbon and how it applies in Ireland. This is because, unlike in 1992 when Denmark got opt-outs from the Maastricht Treaty after it was rejected in a referendum, Ireland is seeeking no opt-outs at all from the Treaty - not even on the thorny issue of the mutual defence clause, which experts say is incompatible with Irish neutrality. This is a disaster for Brian Cowen. Nothing at all in the Treaty has been changed - Irish people now have even more reason to vote no than they did the last time, because now it's clearer than ever that the EU has not a shred of respect for their concerns. While EU leaders meet today to discuss how to best pretend that they are going to present a different Treaty to the Irish a second time around, Open Europe held an event at The Centre in Brussels, in collaboration with the Bertelsmann Foundation. We will write more tomorrow about exactly what is being cooked up by EU leaders, and what it all means, but in the meantime, here is a summary of what went on at the event. Newly elected MEP Joe Higgins, for the Irish Socialist Party, kicked off by pointing out that the debate about what Ireland will do next is not about whether the people want to leave the EU, but rather about what direction the EU was heading. He said, “There are many red-herrings on both sides of the debate”, and described the process going on behind closed doors today at the European Council as “an elaborate charade” to make people think they will be voting on a different text a second time around. He noted that, according to the draft conclusions of the Council, the Treaty itself will not be changed prior to the second referendum, saying the agreement "doesn't advance the issue one iota." He noted, “It is exactly the same text, word by word, not even a comma has been changed”, and noting that none of the Irish people's real concerns are addressed. When questioned by a Commission official in the audience about why we should bother referendums, when "nobody votes on the question asked", Mr. Higgins said it was "highly arrogant" for someone from the Commission, or indeed anyone else, to stand up and claim that the Irish people had no idea what they were voting for. He said that the results of the vote were barely through before people started calling for a re-vote, and noted: "The right of Irish people to disagree was being questioned." He noted that ahead of the second referendum, the establishment would "terrorise the Irish because of the Irish crash" in the economy. He said this would be "the biggest red-herring of all" in the debate, and challenged proponents of the Treaty to clarify what exactly in the Treaty would help to stop people in Ireland losing their jobs. 3) If Ireland votes no, the Union would see a “break up into first and second class Member States”, which would distort proper functioning of the EU. He said: “United we can be stronger, together we can maintain peace and prosperity” and said the guarantees Ireland have been promised would be carried out in a similar way to those awarded to Denmark at the Maastricht ratification process in 1992. “These types of declarations have worked before, and there is no reason to believe they wouldn’t work again. They are legally binding declarations and have been a big success”. Jens-Peter Bonde reacted from the audience, stating that “EU Member States cannot enter into international agreements”. He said: “These declarations are politically binding, but they have no legal value. All of the Danish ‘guarantees’ have been breached, every single one of them, so they are not legally binding guarantees”. Brok's pretty feeble response was: "This decision will become a protocol and then it will become legally-binding." Paddy Smyth, Brussels correspondent for the Irish Times said, “it is not undemocratic to ask the people to vote again. I would agree with Joe; nothing has changed in relation to the declarations. It is a question of clarifications entirely, apart from the guarantee of an Irish commissioner”. For an unswerving advocate of the Treaty, this is quite candid stuff. He said: “Nothing in the declarations materially affects the treaty text. If there was a material difference, then the Treaty would have to be re-ratified in all the other member states” and said that “the difference to the Danish case is that Denmark got an opt-out, which was a material change in effect”. Smyth pointed out the differences between the yes and no campaigns for the Lisbon Treaty, stating that “the yes-campaign was a defensive campaign addressing those issues raised by the opposition to the treaty, such as abortion or workers’ rights. Many of the proponents of the Treaty had not read it and didn’t understand it to properly defend it”. The no campaign, he claims, will “gain much steadier ground through the debate around the guarantees”. The Daily Telegraph Brussels correspondent Bruno Waterfield said that in one sense, it was “great to have a second chance for a debate, especially when other countries haven’t had the chance for even one”. He argued that the “EU is a club of leaders and administrators that are running away from debate, and rely on legal forms and arguments. But no one really understands them, and they don’t really mean anything”. He said: “now is the time for an open and honest debate, an open debate about Europe, but it should not be governed by legal nonsense. The sad thing is that the EU, which is supposed to be about the rule of law, is tying itself in knots to obfuscate politics. The guarantees say more about what the Irish people want, in a kind of a cartoon depiction of what the leaders think the Irish referendum was about”. Waterfield concluded by saying it was indeed necessary to have this debate, particularly in a time of economic crisis. There's loads of interesting stuff in this new YouGov poll for Channel 4. 32,268 people were polled online between 29th May and 4th June, right before the elections. Q: If you do vote in the European Parliament elections will you be voting mainly...? It's no surprise that most people were not - shock horror! - voting to actually influence the makeup of the European Parliament, but it is very interesting to see that people did in fact use the vote to express their views on Britain's relations with Europe. A very common complaint from the Commission, the European Parliament, Labour, Lib Dems and all the other ever closer unionists is that people use European elections not to think about Europe but to deliver a verdict on the current domestic situation. This is especially true this year, with the UK political scene in meltdown and everyone talking about the (mostly UKIP) 'protest vote'. These results turn that argument on its head. Secondly, the poll also showed that 39 percent agree with the statement “The UK should withdraw completely from the European Union”, compared to 38 percent who disagreed, and 16 percent who said they neither agreed nor disagreed. 22 percent agreed strongly. Back in April, we urged our supporters to write to their MPs (again) to ask them what they made of comments made by veteran Labour MP Alice Mahon, who had resigned from the party in disillusionment with the Government's failure to deliver on promises in the 2005 Labour manifesto, including a referendum on the EU Constitution - renamed the Lisbon Treaty. We asked our supporters to send us any replies they received. For the most part, they were predictable, with the vast majority of Labour and Lib Dems MPs rolling out the same tired old lie that the Treaty was significantly different from the original EU Constitution. However, sifting through the piles there are a couple worthy of note. To borrow from an old phrase, a month is a long time in politics, and some of the responses look that bit more interesting in the context of the upheavals of the last couple of weeks. "My position on a referendum on the Lisbon Treaty is that it is irrelevant to a certain extent. My point being is that there needs to be a full debate on Europe as whole (sic) with a subsequent referendum on the issue. Both arguments must be heard and the public must be comprehensively informed but I think it is important that this subject is resolved once and for all." "There will be atime for a referendum but there has not been a seriousdebate where all sides of the argument are put It reqires an honestdebate based on facts I believe it is an issue which will be seriouslydebated in the next few years"
"I detect a big embarrassment in his words 'I acknowledge' - he has never used them before in his previous reply letters on other subjects! So he is very worried about his election local majority prospects... Recently he has spent a lot of effort in the local newspapers trying to distance himself from the expenses scandal, and is now suddenly very supportive of any local issue – very worried about his future!" "I think we have to wait for what happens in Ireland- but think a vote is still a possibility- but will look into it again". But probably our favorite response is this one-liner from Conservative MP Douglas Hogg, whose constituent simultaneously asked him about "ending the abuse of MPs' expenses". Remember this was back in April, before we found out, courtesy of the Daily Telegraph, that The Rt. Hon Mr. Hogg had kindly billed the taxpayer for the cost of clearing his moat, tuning his piano and having stable lights fixed at his country manor house. "I am in favour of a refendum and the abuses do need to be curbed." It's a good job that Lady Kinnock was not Europe Minister this time last year when the Government was falling over itself to persuade us that the EU Constitution Lisbon Treaty was nothing to bother our little wooden heads about. One particularly misleading and often repeated claim was that the Treaty secured Britain's veto in foreign policy - that "unanimity in decision-making will remain the rule (i.e. the UK will hold a veto)", as the FCO told a Commons inquiry. Ed Davey: "The changes wrought by the treaty involve no new powers for Brussels but a simple and sensible reallocation of powers between those responsible for this area of policy. Foreign and security policy remains, as it always has been, in the control of member states. Britain controls its veto on all key decisions." "Vetoes are a problem in foreign policy. We need the foreign policy reforms which were in the Constitutional Treaty". Indeed. As we have long argued, the Treaty, just like the Constitution that preceded it, introduces majority voting into a dozen areas of foreign policy (See page 3 here). Check out this blatent example of EU propaganda, found on the website of our New Europe Minister Glenys Kinnock (or is she?) "My life as a European" is a pamphlet produced by the Party of European Socialists, using public money channelled through the European Parliament. "The aim of this story is to tell you about their day-to-day lives and those of their friends and acquaintances, and to show you the benefits brought about by the European Union, the European Parliament and especially the Parliamentary Group of the Party of European Socialists." For more on why we think this is an unacceptable use of public money, see our research on the EU's £2bn yearly campaign for hearts and minds. It's 11pm and there's still barely any results from the UK elections to the European Parliament. Other countries, including France, Germany and Poland, which voted today, as opposed to on Thursday, have already published theirs. Labour keep the Northeast (down 9%) coming top (Hughes), while the Tories came second (up 1%) (Callanan), and then the Lib Dems (Hall) (0%). As 3 seats are up for grabs within a PR system, all three get a seat. It's obviously likely to be all downhill from here for Labour, however. There's been a record low turnout at 43% across Europe - down from 45% in the 2004 elections. And there seems to be a perhaps counter-intuitive surge in support for centre-right parties, at the expense of the Left. See here for the BBC page which will update as the results (finally) come in. In the studio, Emily Maitlis is using Open Europe's figures published on Friday which show that each MEP costs EU taxpayers an enormous £1.8m a year - research also discussed in detail today on Andrew Pierce's show on LBC Radio. Meanwhile, the Democracy Movement have published a good argument why the likely results show Gordon Brown must not now "indulge with his fellow members of Europe's political elite in another bout of 'carry on regardless'" when he goes to the EU summit the week after next - when the details of how Ireland will be bullied into ratifying the Lisbon Treaty will be hammered out. Amid the Cabinet reshuffle, we learn the Europe Minister Caroline Flint has resigned, after failing to be promoted to Health Secretary, a position which she has apparently been coveting. Iain Dale has the full text of her resignation letter, in which she accuses Gordon Brown of running a 'two-tier Government', and laments her lack of invitations to Cabinet meetings, saying she has been "only invited once since October and not to a single political Cabinet - not even the one held a few weeks before the European elections." Not to worry Caroline, maybe the Prime Minister just needed briefing on the Lisbon Treaty, and you're not exactly qualified for that. And so we learn that the new Europe Minister is to be the serial junketeer Welsh MEP Glenys Kinnock, wife of former Labour leader and EU Commissioner Neil Kinnock. Unable to find anyone currently serving in Parliament to fit the position, Brown will elevate Glenys Kinnock to the House of Lords to take over. Our recent ranking of MEPs gives us some easy-access info on the new Europe Minister. In a vote in the European Parliament in February last year, Glenys voted against an amendment which asked that the European Parliament "undertake to respect the outcome of the referendum in Ireland" on the Lisbon Treaty. 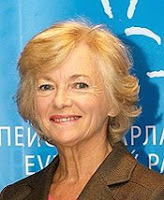 She has also chosen to opt into the highly controversial and dubious second pension scheme (see here, here and here) and in 2005, Glenys Kinnock was among those MEPs that vetoed a proposal which would have ensured that MEPs' contributions to the second pension scheme could no longer be paid out of MEPs' allowances, but would have had to come out of their own pockets. Glenys did not do particularly well in our recent ranking of MEPs, coming 65th out of the 78 UK MEPs. However, she was not present for 5 key votes which we used in our league table... probably off on a 'fact-finding' mission somewhere. Glenys is the most well-travelled of all UK MEPs, clocking up almost 130,000 air miles over the past five years, enough to travel around the world five times. Some of these included 'fact-finding' missions to the Seychelles, and trips to the Caribbean in May this year. It seems like Germany has broken with the principle of independent central banking, apparently fed up by the policies of the European Central Bank. The Financial Times reports that German Chancellor Angela Merkel yesterday criticised the world's main central banks in surprisingly strong terms, suggesting that their unconventional monetary policies could aggravate rather than ease the economic crisis. Merkel told a conference in Berlin: "What other central banks have been doing must be reversed. I am very sceptical about the extent of the Fed's actions and the way the Bank of England has carved its own little line in Europe.” She added that “even the European Central Bank has somewhat bowed to international pressure with its purchase of covered bonds," and concluded saying: "we must return to independent and sensible monetary policies, otherwise we will be back to where we are now in 10 years' time." The very important decision by the ECB to cut interest rates to a record low of 1 percent, and to embrace "quantitative easing" for the first time was taken some weeks ago. As The Telegraph reported, the latter meant buying 60 billion euros of covered bonds in an attempt to kick-start the economy, as the lever of lowering interest rates is all but exhausted. The FT now writes that it is likely that Germany will have to account for about 25 percent of the 60 billion euro stimulus. 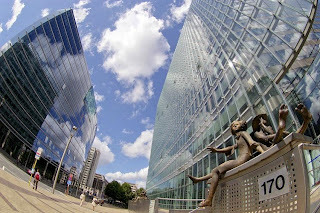 In the meantime, another announcement was made that will allow the European Investment Bank, the EUs long-term lending bank, to gain access to ECB funding by taking part in the central bank's money market operations. It seems like there is no end of measures that are likely to prey on German sensitivities. Germany, and its Bundesbank chief Axel Weber, has always opposed these kind of actions, fighting “a rearguard battle to head off Quantitative Easing, calling it an 'undesirable option' that risked inflation later", as Ambrose Evans-Pritchard notes. He adds that the ECB's decision to fund more monetary stimulus signifies a defeat for the Bundesbank in a very important battle against national governors from southern Europe and Ireland and "touches on a raw nerve in Germany where critics have always suspected that EMU would turn 'soft'" and that "it may set off a political backlash." Indeed it now has. After ECB board member Marko Kranjec said that the covered bond purchase program would "very likely" cost more than the initial figure of 60 billion euro and that the ECB will even consider asset purchases beyond (the very safe) covered bonds, German Bundesbank President Axel Weber was forced to counter him, openly opposing “further monetary and budgetary expansion in the middle and long term”. And now a German Chancellor has waded into the debate, rejecting the ECB's policies without leaving any doubt, ironically violating the 'sacred' German principle of central bank independence. While the Wall Street Journal supports Merkel's criticism, Jean-Claude Trichet and Ben Bernanke have defended themselves. Whether the course the ECB has taken will reach its goal is debated among economists, with some warning of hyperinflation as a result of its actions. So what do we have now? Germany dissatisfied with ECB policy, as it confronts the reality that the German tradition of "hard money" is not shared with the same vigour throughout the EU and that the Bundesbank's influence on the ECB is not what it once was. Germany's rebuke to the ECB is closely linked to the German government's stance towards the idea of common issuance of European sovereign debt, which would in effect see Germany as guarantor in chief to the eurozone. Despite earlier claims by the German government that it would bail out struggling eurozone states, such as Ireland, the German ruling classes are wary of being locked into guaranteeing other member states. However, in the Times Anatole Kaletsky has argued that the EU's 'balance of payments facility', recently doubled to 50bn euros and underwritten by the EU budget, is evidence that the German government is being less than honest to its people about the true extent to which Germany is already guaranteeing the debts of struggling member states, describing it as Europe's 'secret bailout' and a 'perversion' of democracy. Germany is treading a fine line between holding the eurozone together and telling the German people some uncomfortable truths about the responsibilities that were implicit when EMU was first launched. As Derek Scott, vice-Chairman of Open Europe and former Economic Advisor to Tony Blair, said in our EMU debate: "it seems to me that Mr. Delors was probably right, saying that this thing cannot exist without having a political union". Whether or not citizens feel they belong to one European political union and demos, is clear. They don't. At least now politicians are finding it harder to disguise the reality: monetary union is unsustainable in the long term without political and fiscal union. The Bundesbank's loss of influence over the ECB, which steadily seems to be slipping out of Germany's hands, has got to the point that a German Chancellor is prepared to give up the sacrosanct German principle of the central bank's independence. It serves to illustrate the wider point that Germany is no longer in charge of its economic destiny and, at the same time, is increasingly responsible for the fate of others'. Maybe, in the end, it will not be a weak periphery economy such as Greece that leaves the eurozone, but rather a Germany, whose population refuses to bear the responsibilities that monetary union inevitably brings. While the UK won't publish the results of the European elections until Sunday, in the Netherlands, where the elections have also been held today, the 'unofficial' results have been made public right after the election. As this article explains, European rules say the results can only be published in 3 days time. However the Dutch municipalities seem to disagree and the State Secretary supports them. Whether the European Commission will sue the Netherlands, which it considered doing 5 years ago, was not disclosed by a spokesman who said: “we won't consider the situation yet. We want the Netherlands to respect the rules”. The article further explains that in the Netherlands an electoral law obliges the municipalities to directly count the votes in public after the closure of the ballot boxes. The idea is that every voter who wishes so, can be present at that moment. The results are then sent to Dutch press agency ANP, and are unofficial results, as the official result will only be announced on 11 June. In 2004 the Commission threatened to sue the Netherlands at the European Court of Justice, but didn't follow through. Reportedly this was because of the Netherlands' defence that the results were "unofficial", but also because the country was due take up the EU presidency some weeks later and it would have been 'strange' for the European Commission to sue the EU presidency. Why can't the Gov be this candid about Lisbon? Good observation. In fact, Andrew Duff is always pretty honest about the slow movement of powers from national to EU level. The only difference is, that while he welcomes this, we think it dilutes democracy and results in policies which aren't necessarily good. Some of his recent musings make for fascinating reading. Here is a staunchly integrationist British politician who is willing to stand up and defend his views without apology. In the opening paragraphs of his new book, "Saving the European Union, the Logic of the Lisbon Treaty", for instance, he describes himself as a "militant federalist." Some of the analysis from the book is worth repeating here. There is too much for one blog post, so we will come back to it again before too long. Andrew was one of the members of the Convention on the Future of Europe, which drew up the EU Constitution, later renamed the Lisbon Treaty. But perhaps most importantly of all, given the upcoming EU summit and the stitch-up there will be to con Irish voters into thinking they will be voting on a different text a second time around, Andrew confirms that the best Ireland can hope for is a bunch of non legally-binding political promises from the rest of the EU leaders that somehow assuage their fears about the treaty. We will return to this very soon. Where are EPAs going wrong? With the European elections, and the ongoing expenses furore, discussions about policy have not been number one on anyone's agenda of late. However, we have just noticed this well-thought out piece on the website of the International Centre for Trade and Sustainable Development, examining the ongoing negotiations surrounding the Economic Partnership Agreements (EPAs) between the EU and various African, Carribean and Pacific (ACP) countries. It picks up on similar criticisms we have raised about EPAs in the past, see here and here. The piece raises an important point about the standstill clause in the EPAs, which would require countries to bind their tariffs at current applied rates, even when their bound rates (the maximum level the tariffs can be raised to) are higher. 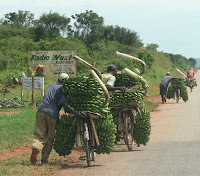 In other words, if African markets were flooded with cheap imports of produce from the EU, those countries would be unable to raise their tariffs temporarily in order to protect local producers and produce. This point is particularly acute in light of what the piece goes on to say: "Given Europe's recent decision to re-introduce export subsidies to support its farmers through the economic crisis, African countries are more likely to need effective responses to import surges." Have a look at the article for the full discussion on where the EPAs are going wrong. Amid the ongoing 'expenses scandal', and on the day of elections to the European Parliament, we've published a comparison between the cost of the European Parliament and the cost of the UK Parliament. We've found that the European Parliament costs taxpayers a staggering £1.8 million for each MEP per year. This is in contrast to the House of Commons, which costs taxpayers £364,000 for each member per year, and the House of Lords, which costs £208,000 per member per year. Just stumbled across this ITV ad for the Europa propaganda Diary, which the European Commission has been distributing to schools throughout the EU since 2004 in an effort "to explain society to young people", in the context of the EU. "the young generation is crucial for the future of Europe, but there is no need just to repeat this line... we need to prove it... this European diary might be a first step to explain, not just to have information offered." "From one end of Europe to the other, young people are preparing to take their first steps as responsible adults in society, where it is important to know the pitfalls. Schools can order the Europa Diary from the website of the Generation Europe Foundation, which publishes and distributes it on behalf of the European Commission." Since when was it the European Commission's job to warn adolescents about the "pitfalls" of adult life? Bizarre. See our December 08 publication on EU communication policy for more on how the Europa Diary is just one part of the EU's mutli-faceted (and expensive) campaign for hearts and minds. In a very welcome move, the Conservatives have today unveiled a new Bill paving the way for a referendum on the Lisbon Treaty. Sound familiar? A bill went through last year but of course the Government conspired with the Lib Dems to stop it from passing - despite the fact that all the main parties had promised voters a referendum in their 2005 election manifestos. Leaving aside the inevitable questions about when the Bill will actually be introduced and whether it has a hope of passing, this seems like a very good moment to force it onto the agenda. Politicians of all colours have spent the last few days and weeks talking about the urgent need to restore voters' trust in MPs, and to bring politics back to the people. This is an opportunity for them to redeem themselves and show that they actually mean it. Goodness knows these people need a leg up right now. A poll for the Times at the weekend showed that 77 percent of people want more referendums. Let's start with the one we were promised. On the Guardian's Comment is Free site, Dermot Scott, the Head of UK Office at the European Parliament, has today responded to an article from our Research Director Mats Persson on the MEP expenses scandal. He argues that Mats' article and the recent media coverage (see here, here and here) of MEPs' expenses is "opportunistic" and "unfair", describing much of it as "inaccurate or tendentious." His article warrants a response on several counts. Firstly, think about this for a moment. Where else in the world would a civil servant - in this case a parliament staffer - feel it his or her place to criticise civil society for trying to hold elected representatives and 'democratic' institutions to account? It strikes us as extremely strange - can MEPs not defend themselves? Imagine an information officer at the UK Parliament penning an op-ed to criticise the Daily Telegraph for its work on MPs' expenses? Or, imagine the same information officer having the nerve to actually defend the system. The question is, on what mandate does an EU information officer act as 'politician', even to the extent of brushing aside concerns over the widespread abuse of taxpayers' money? But onto the article itself. It describes the recent focus on MEPs' expenses and allowances as "opportunistic." Of course the recent Westminster expenses scandal has certainly roused people's interest in this subject, but to suggest that we have simply jumped on some kind of 'expenses bandwagon' is just silly. As many MEPs are well aware (and don't appreciate! ), for several years now we've been busy campaigning for a more open and transparent expenses system in the EP. Back in May 2008 for instance, we published the results of our 'Transparency Initiative' aimed at opening up some of the opaque practices surrounding MEPs' expenses, asking MEPs whether their accounts were properly audited and how they spent their staff allowances. Dermot's article also argues that "while the European parliament may still not be perfect, it is only fair to point out that long-awaited reform is at hand". Here, our friend the EP information officer gets completely lost. In his breakdown of MEPs' salaries and pensions he notes that "Pension rights are the same as for a Westminster MP." Under the old system this is true, but under the new 'long-awaited' reformed system, which will come into force after Thursday's elections, UK MEPs will get access to an infinitely more lucrative pension scheme. Consider this: Whereas MEPs used to have to contribute 100% of their salary over ten years in order to receive an annual pension of £15,822, under the new rules, they don't have to contribute anything at all and can expect to receive an annual pension of £27,954 because of more generous accrual rates. But Dermot obviously forgot to mention this. He then moves on to criticise Open Europe's recent league table of MEPs and the criteria we used to compile it. He asks, "why does voting in favour of the Lisbon Treaty mean you're against transparency?" B) We did not in fact include the vote in favour of the Lisbon Treaty but a specific amendment which called on MEPs to “undertake to respect the outcome of the referendum in Ireland” before it had actually taken place. This is completely different to the vote in favour or against the Lisbon Treaty. It's far worse. The proposed amendment was a goodwill gesture towards the Irish people as they prepared to vote on the Lisbon Treaty, but, shockingly, 64% of MEPs voted against it (including 13 out of 78 British MEPs), Only 16% voted in favour of respecting the will of the Irish people. These glaring errors leave us wondering whether Dermot bothered to read our guide to the league table before he leapt to the defence of democratically elected politicians, who can surely stand up for themselves? He also clearly forgot that he's a civil servant (meaning, not a politican) paid by taxpayers to provide accurate and factual information. As a parting shot, he adds "the ranking also has some absurdities that would be laughable if they were not serious, for example giving a high ranking to an MEP who has been investigated by Olaf and was obliged by the European parliament to repay a considerable sum." Ironically, MEPs voted earlier this year to keep documents related to their own expenses and financial disciplinary measures secret and out of public view. This vote was also one of the criteria we used in our ranking. If it wasn't for this vote it would have been possible for the public - i.e us - to identify MEPs caught misuing public money. Hilarious eh. Most of all, Dermot's article demonstrates that any attempt to shed light on the practices and processes at work in EU institutions is immediately construed from those within them as an attack on their very existence. Such outbursts simply serve to remind the public how far removed the European Parliament is from real world politics. Clearly Dermot and no doubt the wider EU establishment would much prefer if us mere members of the public did not take an interest in the nitty gritty of how MEPs actually vote on our behalf - despite the non-stop complaints from everyone there that 'no-one understands or cares about what we actually do'. Expect much more of this bleeting next week when the EP elections are over and the institutions are looking for people to blame for either low turnout or bolstered fringe parties. You can't say we didn't try.